Loving the loose flattering fit, low hip length, 3/4 gathered sleeves, plus it’s machine-washable! This J.Jill top is a good transition piece into spring too, right? 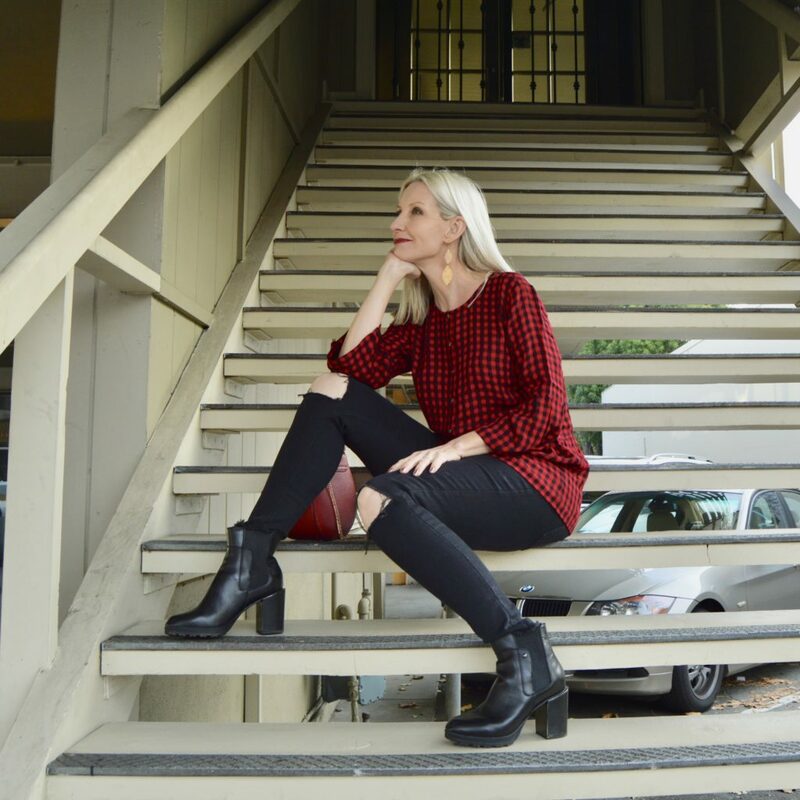 I decided to give the gingham a little edge with my distressed Joe’s Jeans, Anita Jambu booties (c/o), and then accent the red with this cute little crossbody bag (not a real Chloe, but a cute dupe, no longer available). How adorable is she in her beret and stripes and plaid?! How’s everything, Dolls? I’m home sick right now with the flu. Argh … hate it! I have two Christmas parties to go to tomorrow and I’m really hoping that I get to go! Trying to look on the bright side and enjoying my Christmas tree and cuddling with the fur babies today. Thanks for stopping by and don’t forget to link up, Babes! Here’s hoping you feel better soon, Dawn!!! It’s always a bummer to be sick during the holidays!! Dawn Lucy, I adore this combination! The top is so cute and the distressed denim and boots add just the right amount of edge! Perfection. I love the red buffalo plaid trim and need to get some in my wardrobe. This is a darling outfit! Love this casual chic top! Get well soon and thanks for the link up! So sorry you’re not feeling so well. Great top! It’s horrible to have the flu, but this time of year especially. Hope you recover soon so you can enjoy the holidays. Red and black is a fav color combination of mine too. That top is adorable. Love the sleeves. 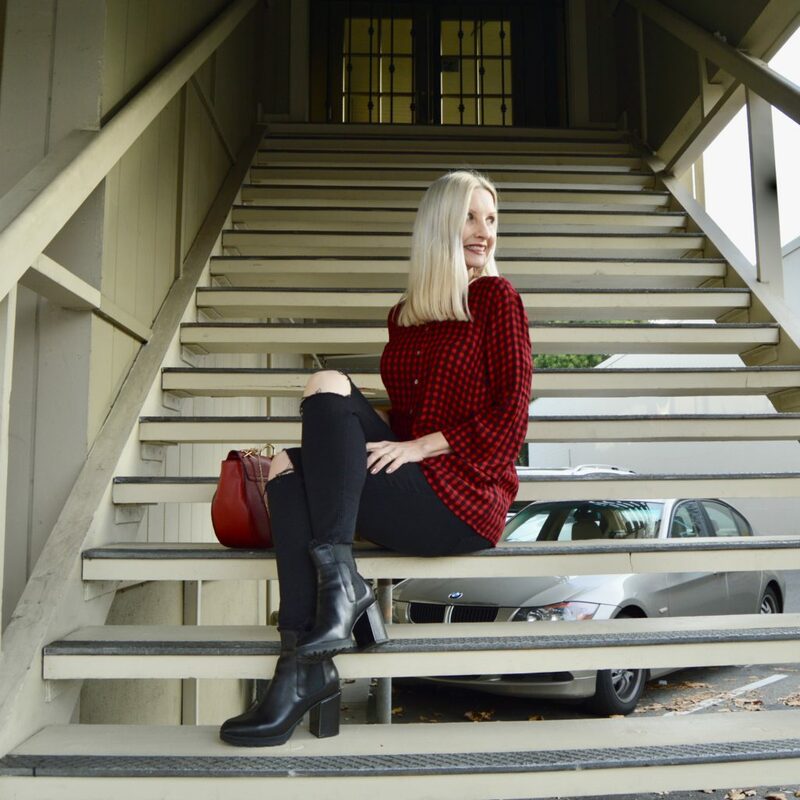 I love red and black—especially with the pop of red in your adorable bag! Thanks for hosting the linkup, and have a fantastic weekend! What a cute top! Also that style of boot is everywhere in Spain right now! They look super easy to wear and put with everything. Hi Dawn, love the red checked top with this look. And the bag is adorable, everyone needs a red bag! Great shirt! Perfect for the season and beyond! Also, thank you so much for the feature. It totally made my day and I have had a crappy week between car troubles, lots of migraines and having snow every single day. Have a great weekend snuggled by the tree, Dawn Lucy! Thanks again!! <3 Ada. love that plaid shirt!! SO cute, and love the black booties! Such a cute top! Love it paired with the red bag!